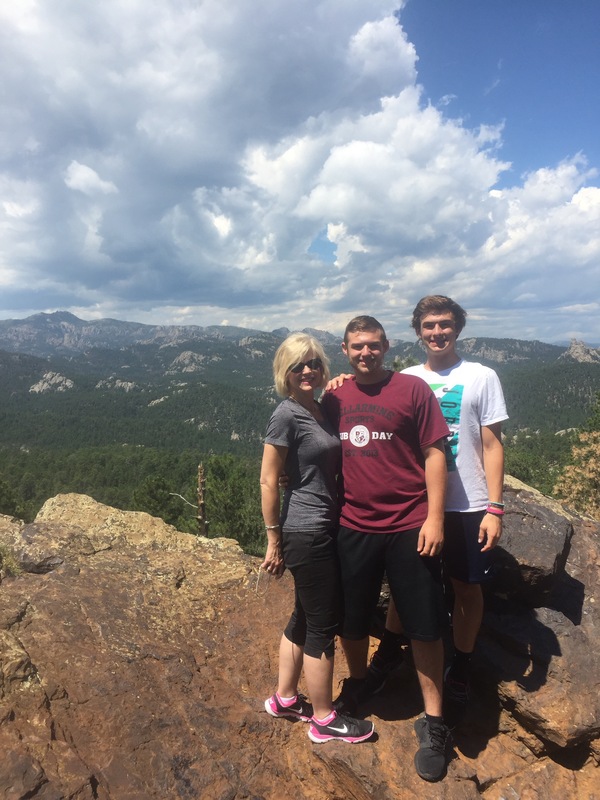 Our 2016 family vacation is to a part of the country that none of us has ever visited – South Dakota. 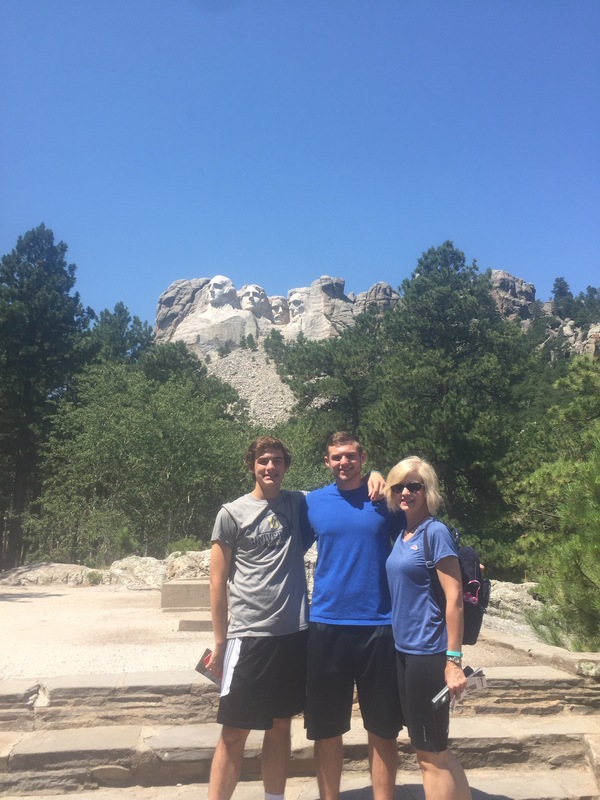 We drive in our rented mini van from Indianapolis through Illinois and Iowa and Minnesota into South Dakota with our first stop in Sioux Falls. 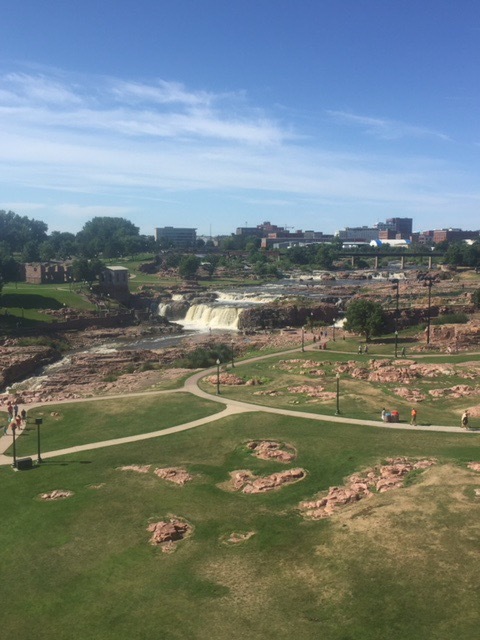 Falls Park in downtown Sioux Falls is really cool! I love waterfalls anyway and we enjoy walking around the park on a gorgeous morning. After lunch, we tour the Great Plains Zoo which is fun since it has been a while since the four of us went to a zoo together. The Blue Angels are in Sioux Falls for their Air Show and we see them flying in formation which is so amazing. 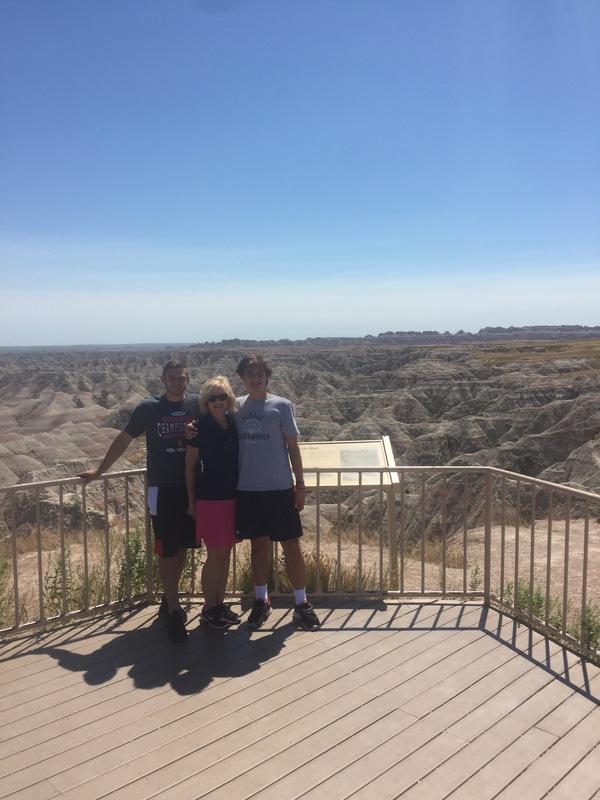 On our third day, we drive from Sioux Falls to Rapid City. We stop briefly in Mitchell at the Corn Palace despite some teenage grumbling. It’s just so goofy that you have to stop! 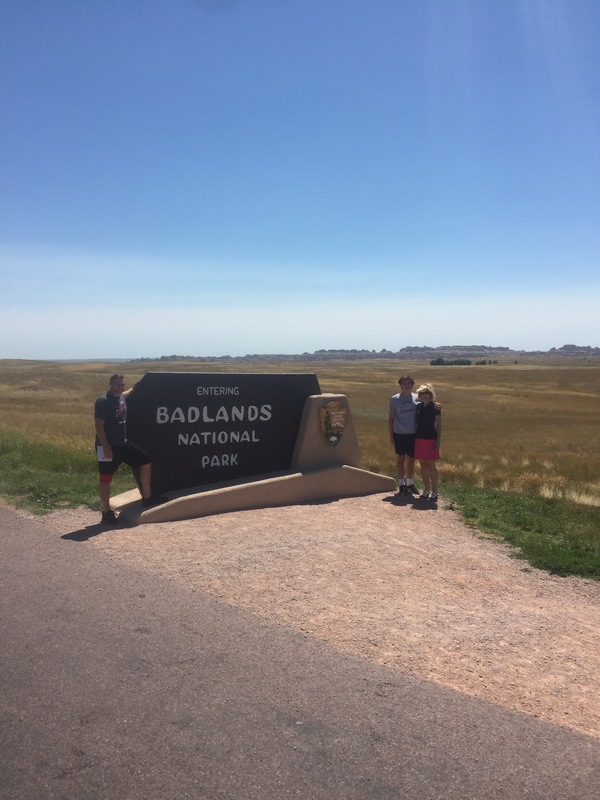 Our next stop, however, makes the drive worth while – The Badlands National Park. It is amazing how just the right set of natural factors can create something beautiful that is unique to this part of the world. For our first full day in Rapid City, we visit Mount Rushmore on an absolutely gorgeous morning. Here is one photo and then Mount Rushmore will have its own blog post. We also have lunch in Hill City and visit the still in progress Crazy Horse memorial. All very scenic and very interesting. The next day we visit Custer State Park. The drive is very scenic with more interesting views of Mount Rushmore. We drive the wildlife loop and see bison, burros, white tailed deer, and prairie dogs. Unfortunately we did not see as much scenery as might have been possible since we were caught in a rain storm complete with hail! After our late lunch, the skies return sunny and we hike part of the Centennial Trail for an hour. The park is so quiet and our hike is beautiful. Our final day in South Dakota is mostly rainy in the morning. We visit Deadwood and find the old mining town not as quaint as expected. 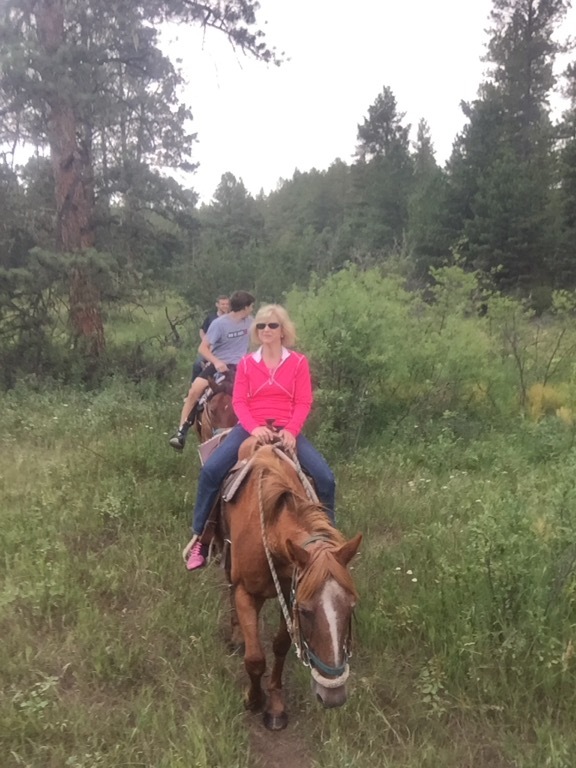 The weather cooperates in the late afternoon for us to gain another perspective on the Black Hills – the perspective of horseback as we enjoy a beautiful trail ride. Since I usually blog about food, I will mention that we ate well on vacation, especially in Rapid City. Even someone who rarely eats beef can eat well out West. I enjoyed lots of salmon and some sea scallops. I liked the bison burger I ate at Custer State Park and it was less greasy than a hamburger. In Rapid City, I recommend Murphy’s Pub, Boticelli’s for pasta, Kol with its coal-fired oven and Delmonico’s for French onion soup. Now – what can you cross off of your bucket list?